The Black Knights is an Enemy in Dark Souls and Dark Souls Remastered. Enemies are hostile creatures that respawn when players rest at a Bonfire or upon death. Special enemies that do not respawn are classified as Bosses, Mini Bosses or Invaders. The Once proud Silver Knights of Gwyn, Lord of Cinder, now roam around Lordan wielding powerful weapons, the Black Knight Shield and the Black Knight Set. It is said that these knights were burnt black in their fight with Chaos Demons, and this caused them to have high Fire resistance. Few even traveled with Gwyn to the Kiln of the First Flame, and then burnt away when he linked the First Flame, leaving behind just their spirits that wander the staircases around. Black Knights have high poise and can deal huge amounts of damage if you simply try to fight them head-on. The best way to deal with them is through Backstabs and Parries as their recover post-attack is relatively slow, making them especially susceptible to such attacks. The attacks are often predictable so hitting the Parry button as soon as you see their hands move and then following up with a Riposte is a very effective and satisfying way of defeating these Knights. Every attack except for the Shield Bash can be parried. WATCH OUT for the shield bashes as they can take away A LOT of your stamina and are often followed by a heavy attack or combo. The knights are also most vulnerable right after having completed a combo attack, allowing you to sneak up behind them and perform a Backstab. It is often easier to run them off a ledge or bridge than to fight them, especially at lower levels. You still get the drops even if they die by falling off. So just let Gravity do the work for you. Ranged attacks are usually the safest way to deal with these knights. Position yourself where they cannot reach you and then unload into them with your bows or firebombs. If you are rocking a heavy build, you should keep your distance as outmaneuvering the knights if not an option for you. Stay at the edge of the Knight's range and strike in between attacks, patiently taking away a bit of the Knight's health with each opportunity. What&apos;s the black knight greataxe drop rate? For anyone having a hard time killing these knights in Undead Burg or Undead Asylum I have a solution. Lead the knight to a set of wide stairs. Bring the knight to the top and circle around him so you are below him. Once you are both on the stairs and you are lower them him get close to bait the shield bask attack. The knight will follow with a stab attack that is easily parried and most of the time will not hit you unless you are basically touch him. After the parry walk up even with the knight and riposte then repeat. This only works with sword and shield knights so trying this with a knight using the greatsword or greataxe will probably get you killed. The Black Knights in Anor Londo respawn. I know because those Beestards killed me a bajillions times. You don&apos;t get the drops. I&apos;m in Remastered v 1.03 Regulation 1.04. I&apos;m in Kiln of the first flame and if I get the black knights near Gwyn to fall to their deaths, I do not get their drops. If I backstab them to death, I do 100% get a drop every time. You forgot the chances of getting the axe from the knights. Could you fix that? My first fight with the one in the Burg back in 20.... (oooh that long ago??) scared me so hard I think a little bit of wee came out...GOOD TIMES! 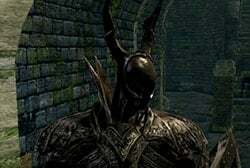 The two Black Knights you fight in the Asylum during the revisit drop Red Titanite Chunks. The Black Knights aren&apos;t bosses, they&apos;re just enemies that don&apos;t respawn.